While hunters have been targeting deer for months, one Duluth, Minnesota man risked his life recently to save a struggling deer from icy waters. 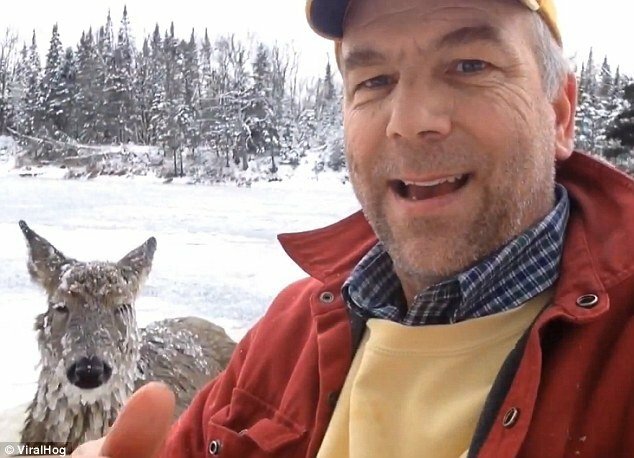 Steven Peterson, who is deaf, was driving home from a friend’s house when he noticed a deer had fallen through the ice. He told ABC-KTRK in Duluth that he could see two arms struggling to stay above the water. “The deer had icicles all over its face and looked like it had been there a while,” he told a reporter. So the former teacher at the Michigan School for the Deaf made his way across the river as the ice got thinner and thinner. He said at one point he could see the water underneath. When he reached the deer, Peterson put a trailer strap around its head and leg and pulled the cold animal out of the water. “I was completely drenched, soaking wet and freezing cold,” he said. The man then waited for about an hour until he saw that the deer would be okay before making his way back to his truck. He said he knew the move was a risk, but if he had ignored it, the guilt would have eaten at him for years to come. Peterson filmed the ordeal in a video that later went viral. He said he named the deer Miss Ice River.